Successfully Added Haier Air Fryer Grill Oven - 60 Minute Timer, 0 to 230 Degree Celsius Cooking, High Quality Glass Bowl, Easy To Clean to your Shopping Cart. With the Haier Air Fryer Grill Oven you will be able to prepare all your favorite meals and snacks in a healthy, eco-friendly, and fast way. No longer will there be the need to drown your food in excessive amounts of oil to get the highly desired crunchy outside, and no longer is there the need to cover your dinner in a thick layer of spices to enhance its flavor. The Haier Air Fryer Grill Oven is capable of delivering a tasteful and healthy meal by purely relying upon its air circulating technology to enhance the food’s natural flavors and to create the highly desired ‘’crispy outside / moist inside’’ effect. Thanks to its built-in timer you can easily set the desired cooking time along with the needed temperature. 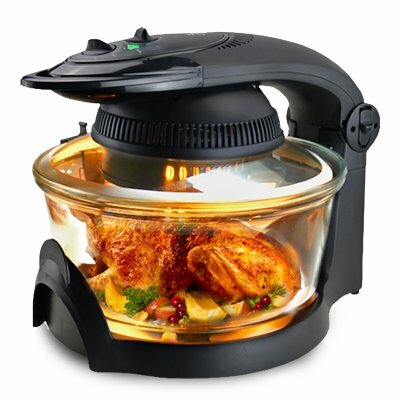 When preparing your healthy meal with the Air Fryer the same temperatures are applied as the ones you would apply when cooking with a normal conventional oven, however, the Haier Air Fryer Grill Oven needs a significant lower amount of time to fully cook a meal as there is no need to preheat the device before usage. This hands-free cooking device is the perfect kitchen equipment that can not be missed in any busy household. With its built in food tumbler you can easily flip your food to ensure that every part of the food gets equally fried. No longer will there be the need to open the oven and reach in with your arms, risking your hands and face being burned by the out going hot air. From now on you can easily tumble your food by the touch of a button. The Haier Air Fryer Grill Oven’s main bowl is made from high quality glass and is dishwasher save – making it a piece of cake to clean this kitchen appliance after usage. Whether you like to bake, roast, grill, fry, defrost, or spit roast all sorts of meat and vegetables – the Haier Air Fryer Grill Oven offers you a fast and convenient way to prepare a healthy and nutritious meal that is low on calories. This Air Fryer comes with a 12 months warranty, brought to you by the leader in electronic devices as well as wholesale electronic gadgets..